CNU Legacy Project shows how Southside Savannah can leverage a growing university campus to improve quality of life. Last spring, a team of volunteer designers proposed a new town center for Southside Savannah, Georgia that connects to the Georgia Southern University Armstrong (GSU-Armstrong) campus, transforming a busy, automobile-oriented thoroughfare into a boulevard. A failing mall could also be redeveloped into mixed-use urban blocks on the scale of Savannah’s historic district. If realized, the plan (produced as part of the Congress for the New Urbanism’s Legacy Projects program) would add a layer to Southside that doesn’t currently exist—walkable, bikeable urbanism with useful green space, made possible by a growing academic institution. Southside Savannah was one of three CNU Legacy Projects, carried out in conjunction with CNU’s annual Congress, intended to leave an enduring contribution of design and technical assistance for the host city and region. Since the Legacy Projects began in 2015, the implementation rate has been more than 90 percent. Southside is located about 10 miles from Savannah’s famous historic core, planned by James Oglethorpe in the 1700s. The GSU-Armstrong campus was established in 1965 in what was then an undeveloped area outside of the city. “Southside residents are proud of the historic core,” says Michael Swartz, a principal at David M. Schwartz Architects, who volunteered his time to lead the design session. “but it’s not a place where they go to meet daily needs. It’s not the center of their community.” A new town center could be shared among residents, faculty, and students of GSU-Armstrong, as well as military personnel from nearby Hunter Army Airfield. The plan is based on the opportunity provided by the merger of the 268-acre Armstrong State University campus with GSU, which plans to expand programs in Savannah. The university has never used the land east of campus because Abercorn is so difficult for students and faculty to cross. Consultants re-imagined Abercorn as a multiway boulevard to solve the problem. Without reducing capacity, the proposed design allows pedestrians to cross more safely. Additionally, the failing Savannah Mall, located about a quarter mile from the GSU-Armstrong campus, is another driver of the plan. Many tenants have left the mall, and broken escalators are signs of poor maintenance. If the mall fails, the site could begin to redevelop incrementally. The mall site is rectangular, and so the design team applied the scale of blocks and a square that are similar to Savannah’s Oglethorpe grid plan. If mixed-use development is to take place here, residential and university-related uses will likely prevail, with civic uses and limited retail and restaurants, Swartz says. The university expansion makes that vision feasible. The design team also examined the underutilized natural assets of Southside, which borders on a marsh. New public spaces could provide sites for fishing, water access, and passive recreation—all connected to residents by bicycle and multiuse paths. 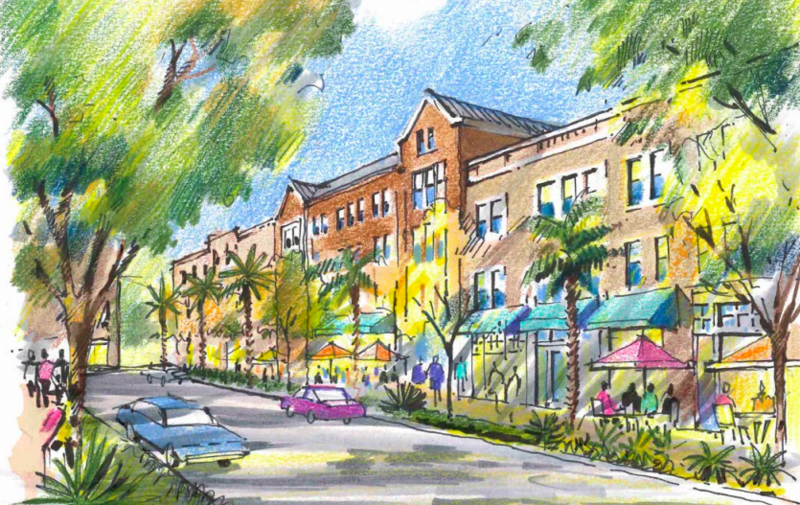 Much of the plan hinges on whether Abercorn can be transformed into something that is designed for more than automobiles. Technically, this can be done—but the change would need the support of the Georgia Department of Transportation. To get the DOT on board would probably require backing from the city, public sector, and university. The latter, a state institution, may have some leverage with the state DOT. In the meantime, Southside has a plan, and that’s a start. As the city entertains redevelopment proposals for the area, the Southside plan provides a point of comparison.